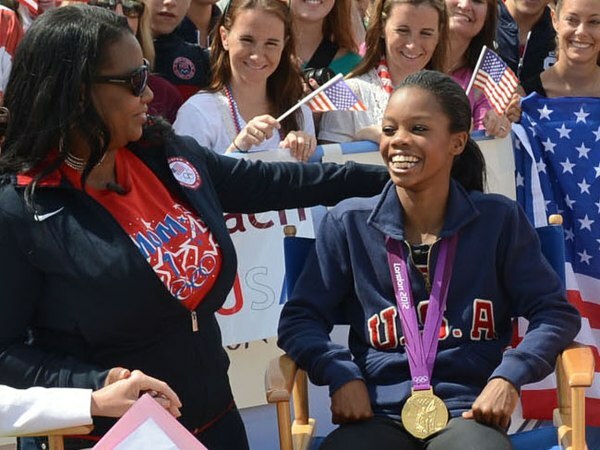 Gabby Douglas and her mom, Natalie Hawkins, on TODAY after Team USA's gold-medal win. Just before the scoreboard showed that Gabby Douglas had won the gold in individual gymnastics last week, her mom Natalie Hawkins had only one reaction: relief. It was relief that came after ten years of training, after her daughter said she dreamt of being an Olympian, and after she let her daughter move away from home at 14 to chase her dreams. The relief didn't last long, as Hawkins soon found herself defending her daughter's hair, which had been swiftly criticized for being both “unkempt” and “embarrassing” very soon after Douglas made Olympic history. In an interview with gymnastics gold medalist Dominique Dawes, Hawkins said when she first saw the comments she was confused. "Because I was looking at the pictures and I was like, 'I'm missing it,' because I don't see what they're talking about. I mean, she doesn't have fly-aways all sticking out, it's not like it's all over her head. It's pulled back into a ponytail." 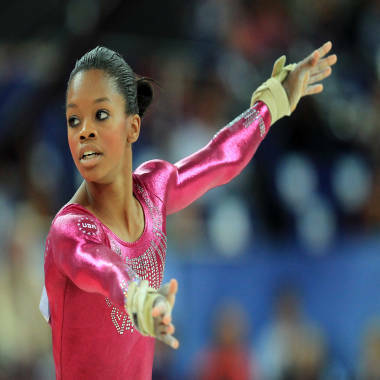 Gabby Douglas has been deflecting online commentary about her hair. Hawkins went on to describe the specific way gymnasts must tie their hair back so that it doesn't interfere with their tumbling. As her daughter competed, Hawkins thought of Douglas sharing a place in the history books alongside Dawes, who was the first African-American woman to win an individual Olympic medal in gymnastics. Hawkins told Dawes that when she imagined Gabby winning the gold she thought of her sharing "that amazing feat with people like the likes of you, and so that was exciting for me to know, that she would be counted on a level and in a category with you and all the other gymnastic greats." She was not considering her daughter's ponytail. According to Dawes, it shouldn't be a consideration. "As an athlete you are not focused on your appearance or you're not going to make those achievements," she said. The attention over Douglas's hair gained ground once it hit Twitter. One user tweeted, “I love Gabby Douglas, but I'm mad at whoever keeps letting her wear that half wig and that silky ponytail on the back of some nappy hair.” Another suggested she did not belong on camera. If Douglas has been fazed she hasn’t shown it, continuing to wear her hair the same way throughout the games. Fans have encouraged her along the way, many coming to her defense. TODAY's Al Roker tweeted Tuesday, "Anybody who has a problem w/Gabby Douglas' hair needs to sit down and be quiet. Enjoy and focus on the accomplishments." When Hawkins spoke about the hair controversy to Fashionista.com, she said that she herself was once guilty of prioritizing her daughter's hair before her training, and had to be reminded that it had nothing to do with her career. “It was actually her coach who told me that,” she said. “I was trying to get her into a hair appointment and I wanted to move her training schedule around and he said to me, ‘She’s beautiful. You don’t need to change her hair. We need to focus on training.’"
Douglas lives and trains in Des Moines, Iowa, with a host family, Hawkins reminded Fashionista.com. "She lives with a white host family and they don’t know anything about taking care of her hair," she said. "And there’s no black salons in their area — not one. We had to work really hard to find a stylist to come and do her hair... It’s really been African-American women that have come out and attacked her. They don’t know about gymnastics. She has to keep her hair in a ponytail 28-30 hours a week." Hair, especially among African-American women, has long been a cause of contentious discussion. As TODAY.com reported last week, media queen Oprah recently went au naturel for the cover of her magazine's September issue, which hits the stands today. The cover has sparked everything from widespread support to accusations that she isn’t wearing her real hair. Douglas herself has summed up the controversy, echoing her mom’s statements in an interview with the Associated Press. "'I just made history and people are focused on my hair? It can be bald or short; it doesn't matter about (my) hair,'" she said. I don't get it....her hair looks fine. It is out of her face and not flying around, what else are they suppose to do? Days after his mom, Ike, told TODAY.com her son "goes out on one-night stands," Ryan Lochte clarified what she was really trying to say about his love life. "I know what she meant by it," he told us. "What she meant is that I'm not in a relationship so I do go on dates. It's not that negative part....She had nothing negative." We feel you, Ryan! Sometimes mom-speak needs translating. The gold medal-winning swimming star addressed another burning question: Just how many shoes out of his collection of 130 did he pack for London? "I brought a total of eight pairs," he said. For his visit to the TODAY set, Ryan also brought along his world-famous set of red, white and blue grillz. 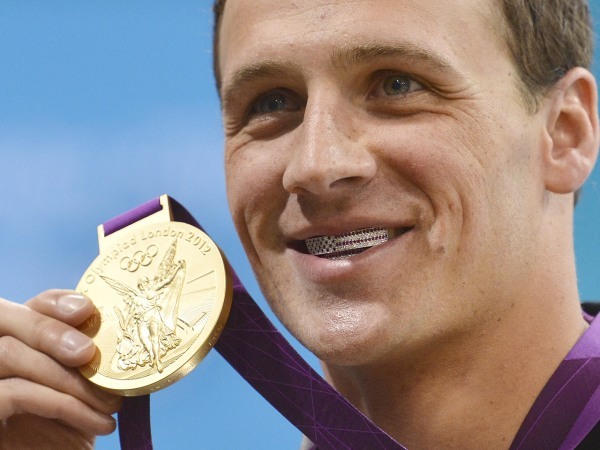 Should we stay tuned for a potential line of Lochte dental wear? A signature collection of grillz could happen, he said, "maybe in my near future." Check out all of TODAY.com's London Olympics coverage here! What is up with that grillz thing? It looks like hell and it makes him look like an idiot. What a stupid thing to do. He has a nice smile and nice teeth. Why make it look like you are wearing braces? What a nut. Ike Lochte is a strong — and emotional — supporter of her son’s competitive lifestyle, but she says Ryan is too busy to commit to a girlfriend. The swimmer celebrates his 28th birthday this Friday, Aug. 3, but Ike says the family will celebrate him on Saturday after he is freed up from competing. 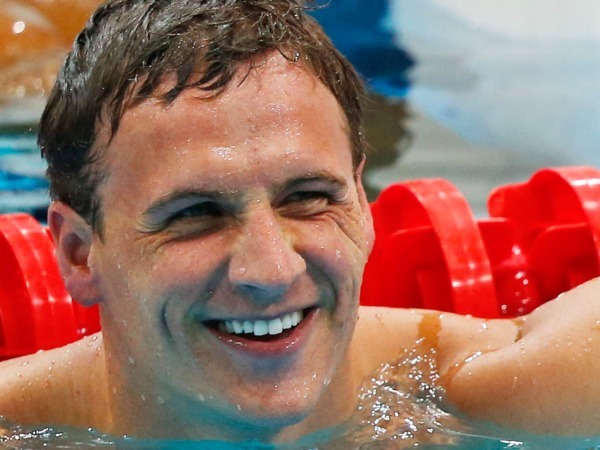 His 4x200 freestyle relay swim airs Tuesday night on NBC. Lochte’s mom, along with the family clan, was on the TODAY set to chat with Matt Lauer about Ryan’s performance so far this Olympics. “Everything he has done has been to the max,” Ike said. “He’s unique, loving, and he challenges himself all the time.” Ryan likely gets much of his drive from his own parents, both of whom were swim coaches. Ike says the best trait he inherited from her is his love of kids and his awareness of his position and his fans. As for Ike, she’s not on Twitter, but she sends words of encouragement to her son via text when she’s not with him. Before he competes, she keeps her message simple: “I say, have fun, and I love you,” she said. Sarika Dani is a TODAY.com editor in London. No lie: She has the same birthday as Ryan Lochte. Congrats to Lochte...and am thinking maybe Mom was searching for a phrase for someone who is dating around rather than "one night stand?" Pretty funny.